NuBits, a stablecoin first introduced in 2014, provides an illuminating case study for how stablecoins work in practice. 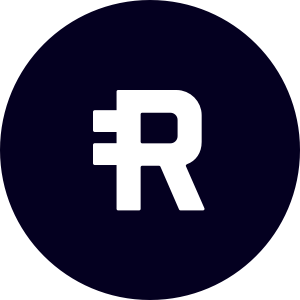 It has been functional for over 3 years, ever since the beginning of the stablecoin concept, and is currently the only live example of a stablecoin in the Seigniorage Shares category. Well, mostly functional. NuBits has suffered two big crashes, with extended peg breaking. Fortunately for us, there are valuable takeaways to be garnered from those crashes. In this post we’ll see how NuBits’ first crash shows how Bitcoin volatility (and more generally, crypto volatility) affects stablecoin demand. Then, we’ll see how NuBits’ second crash was a consequence of its improper reserve diversification. In 2016, NuBits’ peg infamously broke, and it remained broken for 3 months. The initial price drop happened between May 26th and June 20th, 2016. This was about the same time that Bitcoin’s price suddenly spiked, after 6 months of relative stability. It’s plausible that the drop happened because of the following: People who had capital in NuBits saw how Bitcoin was spiking. They wanted to get in on the spike, so they sold their NuBits in large quantities to buy Bitcoin. The NuBits peg was unable to handle the large sell-offs and broke. The price tanked and the peg stayed broken for an extended period. 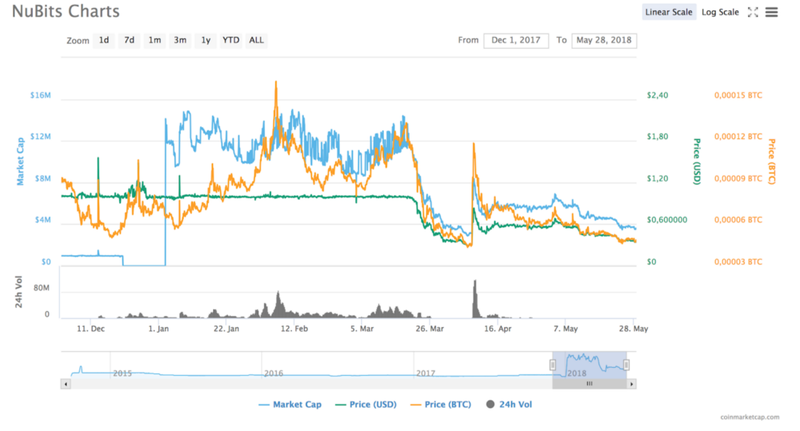 After NuBits crashed in 2016, its market cap grew 1,500% on Coinmarketcapbetween the end of 2017 and the beginning of 2018, going from $950k to $14 million. This is strange, considering the NuBits peg had been broken for such a long period in 2016. Their market cap had been stagnant for years, and suddenly it takes off. Was this spike just an accounting error, or had people suddenly decided NuBits was actually amazing? Turns out the increase was real. However, it did not happen in one day. People were buying millions of NuBits in late December. The price of the NuBits stablecoin was notably above its $1 peg between December 20 and December 28, when it peaked close to $1.50(!). What caused the increase? It’s clear when one looks at the Bitcoin price history. The NuBits high price period starts when Bitcoin had its “Christmas crash.” By December 22 there was a strong news narrative about Bitcoin crashing. As long as there was a lot of uncertainty about Bitcoin’s stability, people kept buying large numbers of NuBits. Then, by the New Year, when Bitcoin temporarily normalized again, the large NuBits buy-ins stopped. What happened, then? Well, Bitcoin holders noted the dropping Bitcoin prices and got worried about an imminent crash. Converting BTC to USD is slow and can lead to taxation. So the worried Bitcoin holders converted their crypto assets to stablecoins rather than cash. Some choose NuBits. The very large influx of Bitcoin money doubled the NuBits market cap several times over. The NuBits folks were frantically printing new money and selling it off to the Bitcoin holders. But demand was so great among panicked Bitcoin holders that the new NuBits couldn’t be printed fast enough and their price was driven up high. This shows how when Bitcoin and cryptomarkets crash, capital rapidly flows into stablecoins. If the crypto market is efficient, then you would expect there to be increased demand for stablecoins in crypto bear markets and strong rapid downward pressure on stablecoin price in crypto bull markets. The case of of NuBits seems to confirm that there is efficiency on this front and that market actors are behaving rationally. However, one can’t help but ask: will all stablecoins suffer the same fate as NuBits? Will they collapse under the downward pressure created by crypto bull markets? Yes, NuBits faced a lot of downward pressure as people sold it off to try to get in on a Bitcoin spike. But the crash ensued because the NuBits protocol wasn’t designed to be able to deal with it. This kind of drop happens in phases when a stablecoin is exposed to a lot of volatility due to demand not being diversified. The way to deal with these cycles of downward pressure — caused in part by lack of diversification — is to have large reserves, potentially many times over circulating supply, which can be quickly used. NuBits had only a small, fractional reserve that was not algorithmically controlled. It could not be used to automatically, with arbitrageurs, cover the drop in demand and keep the price unaffected. Thus, NuBits’ first crash was a consequence of its design. But what about its second crash? Nubits repegged in September 2016 and saw its peg break again on March 21 of this year. Today the price has been fluctuating around 25 cents and NuShares, their volatile equity coin, is down to a market cap of around a million, compared to a NuBit pre-crash market cap around 10 million. This second crash was also caused by insufficient reserves. A lack of reserves prevented the NuBits team from being able to protect the NuBit price from a small demand dip. Then, when people noticed the price starting to drop, big NuBit holders got surprised and afraid and tried to get out of their position. Holders selling off dropped the price further, causing a rapid cascade. It’s not entirely clear why the reserves ran low in the first place. A contributing factor was that NuBit reserves were stored as Bitcoin. Most of the reserves were created a few months ago when Bitcoin was high and people bought a lot of NuBits. 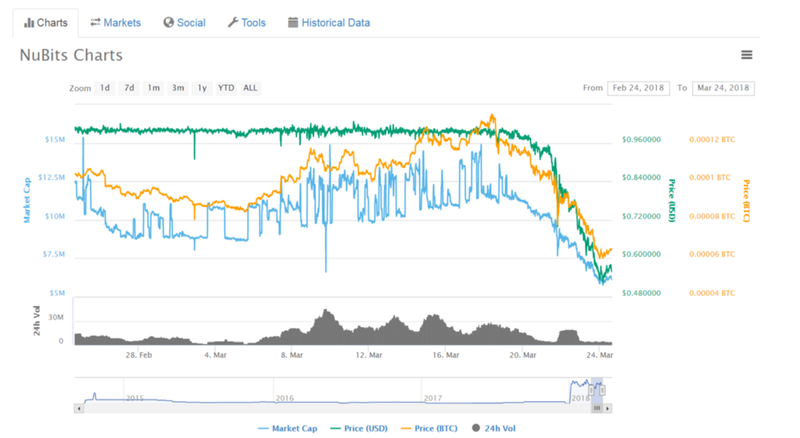 The value of the NuBits reserve fell as Bitcoin’s price fell. NuBits’ fate seems sealed. Even if the peg is restored, few will find themselves able to trust a stablecoin with a peg that has broken twice. NuBits holders are unhappy. A couple holders posted in the forum that it was a scam to promise stability and then have the peg break. They threatened legal consequences. Others were disappointed and left for Tether and/or TrueUSD. Two lessons can be taken from this second crash. First, improperly diversified collateral guarantees that the stablecoin price is volatile to market fluctuations of the collateralising asset. This is unfortunate as the goal of the stablecoin is precisely to hedge against that. Secondly, if a token is presented as a stablecoin and then its peg breaks, the people holding it are likely to get angry and possibly attempt legal action. Overall it seems that Nubits was a victim of its own design: improperly diversified collateral and, on top of that, not nearly large enough reserves to maintain the peg. Though the scenario seems grim, it might not be. It’s likely that NuBits would have had a very different fate had its reserve been well-diversified or, at least, had it been several times larger than circulating market supply.